The single-channel EMG MyoTrac is the perfect combination of sensitivity and ease of use. The light-weight, yet sturdy case lends itself for use in both the clinic and home. Versatile features such as three sensitivity ranges and visual and alarm feedback, make this the ideal tool for muscle strengthening, rehabilitation, and EMG relaxation. 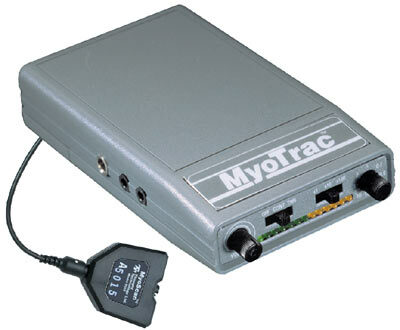 Now, the MyoTrac offers a 60 second delayed threshold alarm. The alarm enables training for microbreaks and resets itself each time muscle activity drops below threshold. Training has never been easier. Two modes of biofeedback - LED and 5-way tone - provide more options. 5-way tone feedback - includes Proportional, Above and Below Thresholds and 4 or 60 second delayed alarm. 13 segment LED bargraph offers a full range of precise visual feedback. Wide and narrow filters provide precise monitoring of normal and fatiguing muscles and eliminate EKG artifact. Above and below threshold options signal EMG activity that exceeds or falls below threshold. DC voltage output connects accessories. The highly-sensitive active MyoScan sensor needs no skin preparation to locate muscle sites quickly. MyoTrac and MyoTrac2 are trademarks of Thought Technology Ltd.